There are a few ways to go Lotte World Theme Park from Seoul, including taxi, public bus, shuttle bus, KAL Limousine Bus, and subway train. 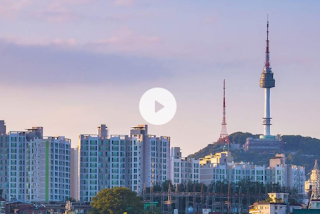 In this post, we will show you the cheapest and fastest way to get to Lotte World from Myeongdong, that is by using Seoul Metropolitan Subway trains. Lotte World theme park is directed connected to EXIT 4 of Jamsil Station on Seoul Metropolitan Subway Line 4. 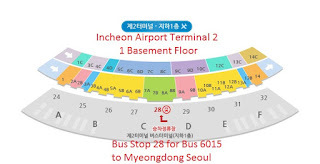 As Myeongdong Station is on Line 2 of Seoul Metropolitan Subway, you will need to change from Line 4 to Line 2 at Dongdaemun History and Culture Park Station. Subway Train Route from Myeong-dong Station (Line 4) to Jamsil Station (Line 2) to get to Lotte World. First board the subway train at Myeongdong Subway Station (Line 4) heading towards Chungmuro Station (not Seoul Station). This is marked with D in the map above. Get off the train at Dongdaemun History and Culture Park Station, Change to Line 2 and take the train heading towards Sindang Station direction. This is marked with T in the map above. Get off at Jamsil Station, where Lotte World is located. Exit Jamsil station using EXIT 4 and Lotte World is in front of you. This is marked with A in the map above. The whole journey will take about 33 minutes to go from Myeongdong to Jamsil Station where Lotte World is located. In this subway journey, the train will pass through 13 station. Arrival at each station is clearly announced in many languages and indicated on the signage on the train. So, do not worry that you will miss the station. Upon arrival at Lotte World, you can enjoy your time at Lotte World by visiting Lotte World Adventure, Lotte World Water Park and the Lotte World Aquarium. After having fun and enjoying your time at Lotte World you can head back to Myeongdong by taking train the the reverse direction heading back to Dongdaemun History and Culture Park and change line to Line 4 to take the train heading towards Myeongdong direction. Taking subway train to got Lotte World is not only the fastest way, but also the cheapest way. If you are buying the subway ticket for a single trip from Myeongdong to Jamsil station, the ticket fare is only 1450Won. Therefore, the round trip will only cost you 2900 Won. If you are using transit card such as T-Money Card, then you can save more money because the single trip going to Lotte World will only cost you 1350 Won and the round trip ticket fare from Myeongdong to Jamsil and return to Myeongdong is only 2700 Won. 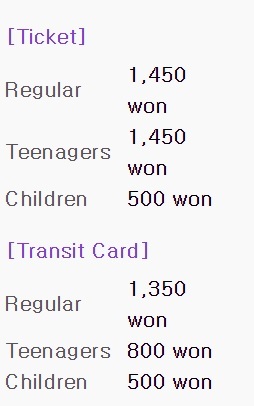 Subway Ticket Price from Myeongdong Station to Jamsil Station where Lotte World is located. Children aged between 7 to 12 years old can enjoy cheaper ticket price (only 500 Won) for the subway trip from Myeongdong Station to Jamsil Station. If you have teenage family members (aged between 13 to 18 years old, it is most worthwhile to buy them transit card because they also enjoy a discount ticket price at 800 Won for their subway trip from Myeongdong to Lotte World. Anyone aged 19 and above are considered adult and must pay full fare for the subway ticket. If you are staying in Myeongdong and would like to go to a good theme park that is nearer to Seoul, Lotte World is the best choice for you. Apart from taking the subway train, there are also other ways to get to Lotte World from Myeongdong using public transport. Of course if you do not want the hassle of taking subway train, you can take the taxi which is a lot more expensive. You can also get to Lotte World using Seoul public buses such as Green Bus and Blue Bus but they are less suitable for tourists who are not familiar with the places and Korean language. Therefore, taking subway train is still the best way (fastest and cheapest) to get to Lotte World from Myeongdong Seoul. Hello! Your blog is very informative and helpful as Lotte World is on my list. But I added Lotte World, Coex Mall and then dinner in Gangnam(with my Korean friend) on our itinery. We'll be staying Myeongdong so I'm not sure if that would be ok? Hello, getting around in Seoul is easy as long as you stay near a subway station (e.g. Myeongdong Station). Coex Mall and Gangnam is just 30-40 minutes from Myeongdong using subway train. For Coex Mall, just use the same subway route as in this post and get off at Samseong Station (삼성역) – Line 2, Exit 5 (Samseong Station is just 3 stations after Jamsil Station). You can get a T-Money card to commute conveniently on subway train and public bus in Seoul. Hi, do you have any idea roughly how much will be the taxi fare from Lotte World to Myeongdong? Thanks! Hello, I estimate the taxi fare from Lotte World to Myeondong or downtown Seoul will cost about 100,000won. Of course, this depends on traffic situation and trip time. Do you know where to buy the bus ticket and Lotte world park admission ticket together just like the agent provide the shuttle bus to Everland kind? hi, if we go for taxi....how much is it? Taxi fare from Myeongdong to Lotte World depends on traffic condition. It may cost more or less 100,000won. Does Daesung Tour provide free shuttle bus ticket to Lotte world if you purchase the ticket with them? Hello, you can buy subway ticket at the ticket machine or ticket counter at the subway station. Just choose child ticket to get child discount. If you plan to use Seoul Subway a lot during your trip, I suggest you get a prepaid T-Money card that offer more discount for subway and bus trip. T-Money card can be bought at many convenient stores, hotels and also subway stations. Hi i was wondering if i am 18 internationally, when i am in korea would i buy for teenager or adult by korean age? where can i buy online ticket for lotte world (1 day pass)..and is it cheaper than buy at the counter? If you transit in a station, you do not have to tap out to change line generally. The subway lines are marked with number and colours. For Lotte World, you can buy the 1 day pass online at https://goo.gl/9i3B3V which is cheaper than normal counter price. Thanks for the great info! You'd shared that a trip by taxi could cost anywhere from KRW100,000. Any idea of the range of travel time eg. 20-40min for clear vs jammed conditions?